Typold is a sans serif typeface created by Jonathan Hill and published by The Northern Block Ltd which comes with improved geometric forms, suitable for typographic use, editorial purpose. It is available in 3 widths (Condensed, Regula, Extended) each with 8 weights and true italics. The wide range of OpenType features and multilingual support easy your work. Cannot miss it! 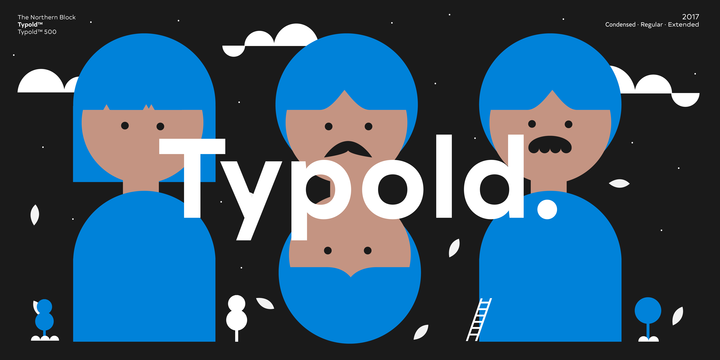 Note: “Typold” is a trademark of The Northern Block Ltd.
Price: starting from $29,55 for one font to $384,99 for all 55 fonts. A font description published on Tuesday, July 25th, 2017 in Fonts, Jonathan Hill, The Northern Block by Alexandra that has 3,658 views.